Shaquille O'Neal talks about the Jeopardy question that went viral about me last week, regarding him breaking both his wrists as a child - and he says it did indeed happen, and he never got them treated or fixed in fear of being punished by his father. We also touch on the downfall of Jamal Anderson, an amazing McDonalds rapper, and Detective Shaq breaks down a bunch of strange cases including the elusive Ring doorbell licker! We also answer a lot of questions in Dear Shaq, of course we get Borderline, and we play a round of Kincade's Match Game. Get into the mix on Twitter by following @Shaqcast or using #Shaqcast - follow The Big Podcast with Shaq on Instagram or Facebook - or email your best stuff to TheBigPodcastWithShaq@gmail.com. Shaquille O'Neal is back in studio with the crew, and he dives right in on the Robert Kraft story again, as the video of Mr. Kraft was set to be released to the media and Shaq doesn't like it. We also jump in on Luke Walton and Magic Johnson both leaving the Lakers, and Shaq thinks that either Kobe Bryant or Jerry West should take over the Lakers and gives some great reasons why. We also discuss Tiger Woods incredible comeback as he wins the 2019 Masters, and Shaq thinks he knows what has changed with him. We also get Shaq's thoughts on the first round matchups around the NBA Playoffs and who he thinks is for real. We also catch up on some amazing news stories since our live show, including the first ever Walmart AND Waffle House, fruit throwing festivals, Will Smith crashing the O'Neal's trip to Miami and Kincade's new puppy. We get to a ton of Borderlines, including a hilarious email from a listener, and we play a round of Kincade's new game called "Click Bait." 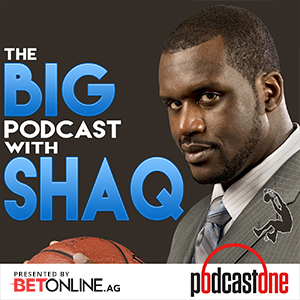 Subscribe to our YouTube Channel for the latest video from the show - follow us on Twitter @Shaqcast, and on Instagram and Facebook at The Big Podcast with Shaq. Or email your best questions, clips or comments to TheBigPodcastWithShaq@gmail.com. Shaq's LIVE 200th episode of the Big Podcast was so loaded we carried it over another week. Craig Gass kicks us off by prank calling Charles Barkley live on stage, and when Al Pacino gets on the phone Chuck wises up and realizes Shaq is screwing with him. We also crown our 2019 Borderline Playoffs champion, recapping our Final Four and having some fun at the expense of Shannon Sharpe. And it's a totally WILD live edition of Dear Shaq - with questions that involve his kids, his relationship with Kobe Bryant (who Shaq claims is his all-time FAVORITE teammate) and even a man blowing up a condom on stage. Wild. Check out the full live show video on our YouTube channel - The Big Podcast with Shaq! Of course you can always follow along on Twitter by following @Shaqcast - follow on Instagram or Facebook at The Big Podcast with Shaq - or email your best stuff to TheBigPodcastWithShaq@gmail.com. Shaq and the crew are LIVE for our 200th episode of The Big Podcast! The show is proudly presented by BetOnline.ag! We open up with Shaq yet again defending Robert Kraft, we discuss how Shaq knew that nothing would happen to Jussie Smollett, Shaq says Trae Young is NOT the Rookie of the Year in the NBA, and we get Shaq's thoughts on who is for real and who isn't as we get ready to start the NBA Playoffs. We are also joined live on stage by Killer Mike, who talks about politics, life in Atlanta, and his powerful new show Trigger Warning on Netflix! We're also joined on stage by the hilarious Craig Gass. And it wouldn't be a live show without a game for the audience, as we present a live round of Black Crime or White Crime! Check out the FULL video on our Shaqcast YouTube channel to see more of what you're missing. Get into the mix on Twitter by following @Shaqcast - follow The Big Podcast with Shaq on Instagram and Facebook - or email your best clips, Borderlines and questions toTheBigPodcastWithShaq@gmail.com. In our penultimate 199th episode, Shaq says that the Greek Freak - now being dubbed "the Greek Diesel" - is better than he ever was at 24 years old. We also catch up with long time friend and sports icon Dan Patrick, who talks about sustaining longevity in sports media and what it takes to develop a winning and long-lasting show. And as we approach our 200th episode, we look back at some of our all time favorite moments from the last 100 shows, including Shaq's horrible gas math, Skip and Shannon, Kincade's male stalker, and so much more! Plus we debut a brand new edition of Borderline. Get into the mix by following @Shaqcast on Twitter - follow The Big Podcast with Shaq on Instagram and Facebook - or email your best stuff to TheBigPodcastWithShaq@gmail.com. Shaquille O'Neal talks about his new deal to become the face of Papa Johns, and how he felt that the company needed a boost that only a guy like him could provide. We also talk about Shaq's appearance on Hot Ones, and the big man says those wings were the hottest thing he's ever eaten! Shaq also comments on the retirement of his best friend Rob Gronkowski, and how he is excited to see Gronk this weekend at Shaq's Funhouse in Miami! And of course we have to pick on DJ Diesel as he announces that he'll be on stage for Lollapalooza in August. Detective Shaq also has a couple great stories to dive into, we unveil the latest winners of our Borderline Bracket, and we play a round of the classic Shaqcast game "Walmart or Waffle House." Get into the mix on Twitter by following @Shaqcast - follow The Big Podcast with Shaq on Instagram or Facebook - or email your best stuff to TheBigPodcastWithShaq@gmail.com. Shaq opens the show this week by debating the college admissions scandal surrounding Lori Laughlin and Felicity Huffman, saying he doesn't think the ladies will face any serious jail time. Plus we get Shaq's thoughts on Lakers weighing the possibility of trading LeBron in the wake of the Anthony David debacle, as he thinks this first year was an experiment. And shockingly Shaq completely agrees with James Dolan who banned a Knicks fan for life after a passing heckle from the stands. We also talk about Russell Westbrook's foul interaction with a fan on the court in Utah, and for a chance Kincade has Westbook's back and Shaq agrees that that's just how fans are in Utah. And of course we talk about Dirk Nowitski's amazing quote about NBA players wanting likes more than wins - and we discuss the Shaqcast's appearance on The Herd with Colin Cowherd. And FINALLY - the Borderline PLAYOFFS have arrived and we roll out the entire 2019 Bracket!!! We also get a full tourney preview from our friends at Vivid Seats! Get into the mix on Twitter by following @Shaqcast or using #Shaqcast - follow The Big Podcast with Shaq on Instagram and Facebook - or email your best clips and questions to TheBigPodcastWithShaq@gmail.com. Shaquille O'Neal is back in studio and having to answer for the Kobe Burger price increase at his new restaurant in LA! We also get into a debate about ESPN's release of their NBA 25 Under 25, and wondering why Trae Young hasn't made the list. Things also get hilarious and personal as we kick around a number of fun topics in Jump Ball, including Captain Marvel, Shaq's biggest lie, John rigging an election, and the classiest people in pro sports. The show also gets our first look around the NCAA Tournament thanks to our friends at Vivid Seats. We dive into the weirdest and dumbest stories of the week from the Dumbass News Desk, of course we get Borderline, and we play a round of the Shaqcast classic game Shootout! Get into the mix on Twitter by following @Shaqcast - follow The Big Podcast with Shaq on Instagram and Facebook - or email your best questions, clips or Borderlines to TheBigPodcastWithShaq@gmail.com. Create a free account on BetOnline.AG and receive a 50% SIGN UP BONUS just by using the promo code PODCASTONE Download the Vivid Seats app and enter code BRACKET for 10% OFF your first order! Shaq and Gronk are back together on this week's show - talking about Super Bowl 53, Tom Brady, retirement rumors, growing up in Gronk's family, and the next appearance of Gronk at Shaq's Fun House in Miami! Shaq also opens the show by bragging on his daughter Me'arah, who went viral for her basketball skills last week, and goes on to discuss how he motivates his kids as players. We get Detective Shaq on a couple strange cases, involving a new Ring doorbell licker and guys who are "blowing up" bathrooms. Plus we finally hear Shaq's side of the Bow Wow incident and arrest that took place after Shaq's Fun House during Super Bowl Weekend. We have some classic dummies in a round of "You Idiot," we answer a ton of odd questions in "Dear Shaq," of course we get Borderline... and it's the return of the Black History Month Quiz! Get into the mix on Twitter by following @Shaqcast or using #Shaqcast - follow The Big Podcast with Shaq on Instagram and Facebook - or email your best stuff to TheBigPodcastwithShaq@gmail.com. Shaq is back in the studio in Atlanta, and dives right in by debating the Jussie Smollett controversy and how Kincade called it as fake news from the very beginning. We also touch on Shaq's lost love for NBA All Star Weekend, saying that he thinks the dunk contest should no longer be the featured event on Saturday if the stars refuse to compete. He also claims that Diallo didn't ask him to be on the court ahead of time, but he does reveal that he told him not to screw it up because they would both look back. When discussing the Lakers and Ben Simmons, Shaq guarantees that Ben Simmons will eventually end up in Los Angeles, while Kincade argues that he will sign for the max and stay in Philly. Plus Shaq's defense of LeBron James, Shaq on the recent round of NBA trades, and another heated debate about Colin Kaepernick. We pay a visit to Uncle Shannon's Neighborhood with some classic moments from Shannon Sharpe, of course we get Borderline, and John brings in a new game called "A Kincade or a Rapper." Get into the mix on Twitter by following @Shaqcast or using #Shaqcast - follow The Big Podcast with Shaq on Instagram and Facebook - or email your best stuff to TheBigPodcastWithShaq@gmail.com.